Lazy Larry agreed to work on a job for his brother-in-law for thirty hours at eight dollars an hour, on the condition that he would forfeit ten dollars per hour for every hour that he idled. At the end of the thirty hours Larry wasn't owed any money and didn't owe his brother-in-law any money either. How many hours did Larry work and how many hours did he idle? Lazy Larry worked 16-2/3 hours and idled 13-1/3 hours. 16-2/3 hours, at $8.00 an hour amounts to the same amount as 13-1/3 hours at $10.00 per hour. 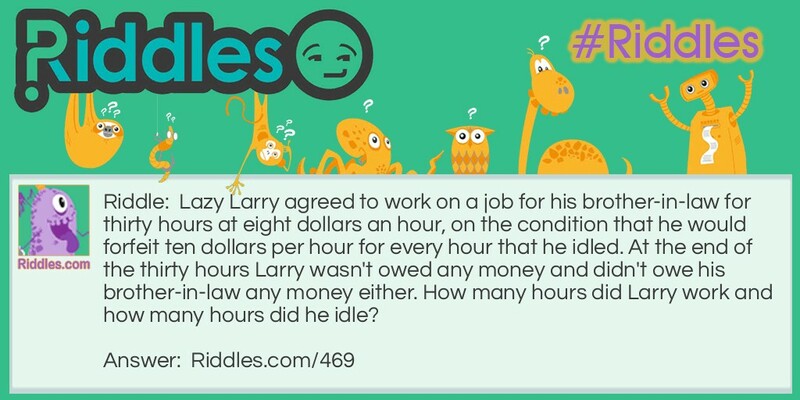 Lazy Larry Riddle Meme with riddle and answer page link.